Would you like to get the NFL Sunday Ticket but can’t get DirecTV at your house? Well, you may just be in luck! Although DirecTV holds the exclusive broadcast rights to NFL Sunday Ticket, DirecTV was required in the NFL Sunday Ticket deal with the NFL to provide an online solution for fans who can’t get DirecTV. Here’s the scoop. 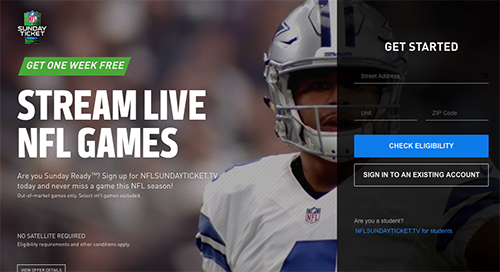 The product is called NFLSUNDAYTICKET.TV and is specifically for people who can’t otherwise get DirecTV service due to line of sight issues or other such reasons. I can’t get DirecTV at my place, so this is right up my alley. If you are college student, you are also eligible to purchase NFLSUNDAYTICKET.TV. To find out if you qualify, check eligibility on their website at NFLSundayTicket.tv. Regular subscribers will just need an address, while student will need to provide more information such as their school and birthday. For the uninitiated, NFL Sunday Ticket provides live out-of-market coverage of every NFL game every Sunday. This means if the game is on CBS or Fox in your area, you won’t get it on NFL Sunday Ticket. You will, however, get every other early & late Sunday afternoon game live. It does not include Sunday Night, Monday Night, Thursday Night games, and some of the International games. NFL Sunday Ticket with DirecTV has been available to those who can’t get DirecTV for several years. 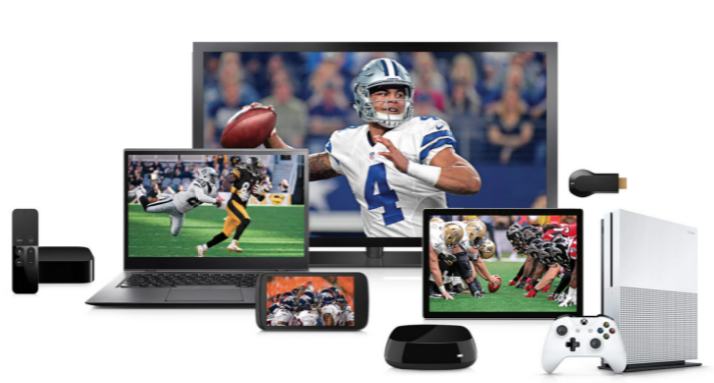 DirecTV re-branded this product back in 2014 as “NFLSundayTicket.TV.” The yearly subscription, which comes in two packages, allows eligible subscribers to watch the NFL Sunday Ticket every Sunday on your computer’s browser, iPad or Android Tablet, certain mobile phones, PS4, Xbox One, Fire TV, Roku, Chromecast and others. The “Max” package includes all the features of the “To Go” package, plus the DIRECTV Fantasy Zone, NFL Red Zone Channel, and the option to purchase NFL Game Pass at a discount. The “To Go” package costs $73.49 per month for 4 months, or a single payment of $293.96. The “Max” package is $395.99 for the season or $99 per month. Note: The price typically will drop midway through the season. UPDATE (Nov. 10, 2018): The cost has been reduced to $146.98 and $209.98 respectively for the packages. Blackouts do apply. If the game is on local TV in your area (Fox, CBS) it won’t be available on the NFL Sunday Ticket. You can only be logged in on one device at a time. For example, you won’t be able to watch one game on a PS3 and another on your computer. According to a variety of sources, the NFL Sunday Ticket app will not work on jailbroken or rooted devices. Be sure to double check that your specific device, operating system, and/or software is eligible. There are no refunds after the start of the season. I subscribed to the service in two different seasons and my review of the NFL Sunday Ticket Online experience is mostly positive. If you have additional questions, check out the following links for more information. The review goes back a few years, but will give you an idea of the experience.